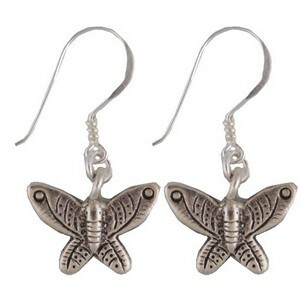 Butterfly earrings, from the Miyabi collection, handcrafted in Thailand from Karen silver and natural stone. Karen silver, produced by the Karen tribe, is respected for its simplicity and beauty. Its matted look has the advantage of making it relatively easy maintenance. Traditional Karen jewellery draws on natural motifs such as flowers and insects and is worn as amulets to ward off demons. Miyabi, the Japanese word for "elegant", is an appropriate name for the collection's simple delicate designs.